We're still harvesting figs from the Chicago Hardy. 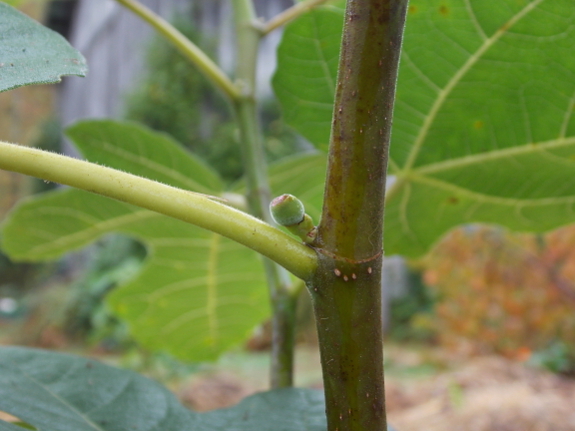 Meanwhile, the figs we started from cuttings this spring are waist-high and are starting to bloom. Maybe that means next year we'll get to taste Dwarf, Celeste, and Black Mission? Here in southern New Jersey I have Brown Turkey figs. I ususally get figs until the first frost. And they dry well in the dehydrator. I have them in their own little mirco climate. South East corner near the woods. So theres no need to cover them through the winter. I've had them for about 10 years and they have gone through some significant snow. I'v noticed that because they are near the woods the leaves just naturally cover them in the fall.